Amazon is back with a new Treasure Hunt contest only for Amazon application users. This time the contest will provide a clue after every 15 minutes instead of one hour. Which means now you can win a product every 15 minutes if you are able to solve the clue that will be listed in your Amazon application. To make it easier we are providing you the answers to the clues so that you can buy the products for free. The contest will be held from 2 PM to 6 PM starting 15th December 2017. 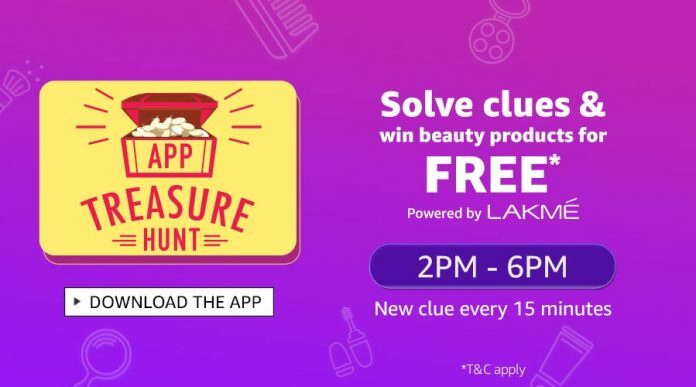 This time Amazon is providing a blockbuster clue in addition to the normal clue, which will help the customers to solve the clue much faster. 2 PM Clue – What’s common in Korba, Jharia, and Singareni? Machael M and Thomas S’s lavandula angustifolia. 5:15 PM Clue – What are Mount Vesuvius, Krakatoa, Mount Etna famous for? To get the answers to the latest Amazon Treasure Hunt question, stay tuned with us. We are continuously updating this article. **We are not associated with Amazon India by any means. If you have any issues, please use our contact form to contact us. Winning is apart but playing was awesome!! !